It’s something of a relief to have figured out a plan amist all the options, which have been clouding my mind of late. And a fine one it is too, I think. Although I’ve actually (strangely enough) revelled in everything the recent snows have brought with them, I’ve decided, in light of the onset of an early winter, to veer off the Great Divide Mountain Bike Route, and make my own way south. It was a tough decision, as I’ve loved almost every mile of this epic route so far; the quiet solitude, the complete remoteness, the oddball towns. In a way, this whole trip hinged around a desire to ride this route; it’s hard to accept change and let go of things sometimes. I do enjoy getting my nose stuck into a good map; anticipation is the beginning of the journey. 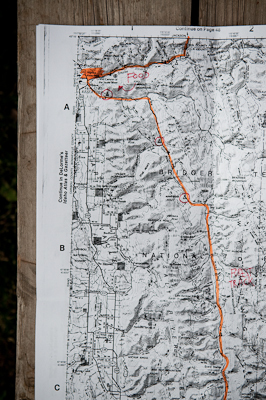 Thanks Evan, and Keith at Teton Mountaineering, for the route planning advice. But at least riding these gravel roads the last month has opened up a whole new world of backwater America to me, and it’s one I want to keep exploring. A conversation with David’s neighbour Evan rekindled my ideas of heading to Moab, by reminding me of the Kokopelli Trail. Then, the kind folks at Teton Mountaineering poured over map after map with me, and together we wove together a network of gravel and backroads which will deposit me right down at Fruita, on the edge of Colorado – a renowned mountain biking locale. Places along the way include Alpine Junction, La Barge, the Flaming Gorge, Jensen, Dinosaur and Loma, via Baxter Pass, if it’s doable. From there, I’ll pick up the Kokopelli Trail, a challenging off road route I’ve long hankered to ride, which will link me to another mtb mecca: Moab, in Utah. Then, (somehow) I’ll weave my way back down to New Mexico, again on backroads where I can, and pick up the Great Divide Route once more to the border. I’m sure to miss the phenomenally detailed route maps I’ve become used to. Many of these forest tracks I’ll now be following south should be just as remote, so, taking a leaf from the Adventure Cycling Association, I’ve spent the morning at Staples compiling detailed topographical state maps from DeLorme, and highlighting where I’m going. I’d thought of laminating them for that final professional touch, but a zip lock bag will have to do. An alternative to the Great Divide Mountain Bike Route? Cass' Gravelly Ride South. Jackson seems mellower and less austentacious than I imagined, though I guess ski season – and the money that comes with it – has yet to kick in. The main square has a resort feel to it, and many of the stores are clad in the veneer of the log cabin or frontier town look. The fruit at the local supermarket seems perhaps a little more buffed and shiny than normal, and there’s a rather grand fireplace there too. But apart from that, Jackson seems to have kept to its roots as a beguiling, laid back mountain town, its roads populated by Subarus and pickup trucks loaded with the mountain person’s paraphernalia of skis/kayaks/bikes. The backstreets are quiet, with simple and elegant contemporary houses interspersed with old, wonky wooden buildings. This entry was posted in Idaho and Wyoming on October 11, 2009 by Cass Gilbert. I was going to write to say that’s what I would do…head towards Utah. I think you are on the right track. I also wanted to attach a couple of links for you. The first one is a link to all of the bike/ped coordinators in the country. 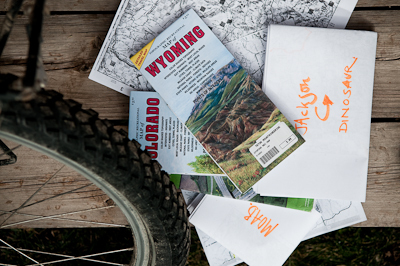 They often have bike maps for their states…not as detailed as Adventure Cycling’s maps, but not bad. But feel free to give those folks a call if you have questions about routes. They often have a pretty good grasp of what’s going on in their state, and can offer some suggestions if you are unsure. Feel free to write me as well. I used to help folks with this sort of stuff at Adventure Cycling all the time…and I know a few things. A former co-worker and friend now manages the floor at Poison Spider Bike Shop in Moab. His name is Matt Olson and his number there is (435) 259-7882. Feel free to call him and tell him that Tom from Adventure Cycling told you to call. He knows that area pretty well. Safe travels and I’ll continue to follow on your blog. Trust you’re getting some rides in before winter! Rides before winter. But at times I’m not as tough as you Cass. On Saturday I woke up and the wind chill was -4 F. I opted to go for a hike instead of a ride. Hopefully you won’t hit any of those temps on your way to Utah. Have a good ride there. On my first trip I crossed paths with a Japanese guy while cycling in Pakistan. I later heard that he disappeared into winter while crossing a remote pass. He left his story to be told by others. I’m glad that you’ll still be telling your own story, as I have come to enjoy the vicarious life. Now I see why my friends encouraged me to write: we can’t all be on the road at the same time. Someone’s got to mind the chickens. So, I’m not sure if Steamboat Springs Colorado will be on your or too far out of your way. I loved that town, riding through this past summer. I especially recommend a visit to the Orange Peel bicycle service shop. Right on the town bike path and an architectural gem. Also, Alan, whose yard you landed in when you first flew into Anchorage, spends these fall months in Moab. You’ll sure meet other folks, but he’d be great to ride with and he knows how to party. Send him an email if you want to meet up. Hey, I hope the new plan works out well. I’ve been watching your progress with awe and not a little envy – I love getting off the highway and you seem to really know how to do it in style. I really wish I’d been talking to you when I was planning my route but I then, I guess there’s nothing stopping me getting hold of a few of those maps myself. I’ve been following your blog for a while (keep up the good work!) and now have a qustion regarding your bicycle, the Santos Travelmaster. I’m thinking of getting a travelmaster myself and read your blog of your trip. What I would like to know is how the travelmaster is holding up. I would like to use it for a bit of MTBing on the road as well and was wondering how the bike copes with that. Also, is there a reason you chose the steel version of the travelmaster rather than the aluminium one (I am atm more leaning towards the latter). Final question, how does the bike compare with the Thorn Sterling that Robert is riding on? I hope you can answer these questions! Hi, I was wondering how your travelmaster was holding up as I am thinking of getting one myself. Does it ride ok as an mtb without luggage and how does it compare to the Thorn Sterling? Hi Kobus. I’m loving the Travel Master, and its holding up really well. I can hit 40 mph in total confidence on dirt tracks, with 30kg of luggage and water, and ride singletrack when laden without a worry (other than what my legs can do). No complaints, in as much as it’s a tourer (with massive clearances, which I love) rather than an mtb. But. You can’t have everything, and the fact that it handles so well with luggage does mean it’s a bit on the harsh side when mountain biking unladen. The Sterling is in many ways a different beast – not rated to carry nearly as much luggage, 100mm fork, tighter geometry, discs etc… I think a better comparison would be the Raven Tour and the Santos. Old Fashioned!!! hahahahaha! I saw all that camera gear and your little netbook! Keep it up Cass, you’re my HEEEERRROOOO!